Sea cucumbers have been shown to provide many benefit and improve medical conditions such as joint pain, frequent urination, rheumatoid arthritis, osteoarthritis, and arthritis of the spine. They are also widely known for their anti-aging properties. Even if you don’t eat them for these properties, they are high in protein with very low in fat, making them a very healthy food. 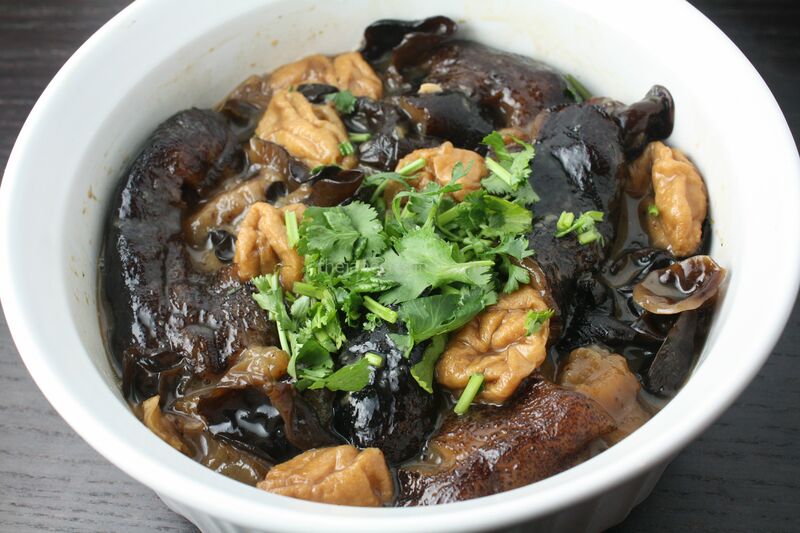 Braising sea cucumber takes about 3-4 hours, but soaking and cleaning of the sea cucumber take a long time. Dried sea cucumber takes about 2 days to clean and soak. If the soaking process is not done properly, all the sea cucumber can be ruined and wasted. Day 1 – Soak sea cucumbers in a pot of water for 1 day. Change the water a 2-3 times. Every time when you change the water, clean the sea cucumber with a brush. Day 2 – Clean the sea cucumbers. Slit them lengthwise, open them flat, and scrape away any residue of the entrails clinging to the flesh. Place them in a pot of hot water and soak for another day. Change water for 2-3 times and clean it with a brush when you change the water. At home, we pre-soaked a dozen of them at a time and freeze them up to a year. When we want to use it later, we can thaw them and they are ready to be cooked. If you do not have time to clean sea cucumber on your own, there are pre-soaked sea cucumbers available in the supermarket. Soak wood ear in hot water and let it sit for 20 minutes. Remove any hard parts with scissors. Heat oil in pan. Add ginger, garlic and shallots, until fragrant. Add in sea cucumbers and stir fry for 3 minutes. Add oyster sauce, dark soy sauce, soy sauce, and sugar. Add 4 cups of water. Bring to a boil and reduce the heat to medium-low. Cover and simmer for 2.5 hours. Add gluten, cook for 15 minutes, then add wood ear and simmer for 30 minutes. Add cooking wine and cook for a few minutes. Looks good and easy to make. Can I use slow cooker to cook the sea cucumber? Yes, you can use a slow cooker, just make sure not to overcook the sea cucumbers as they will dissolve.